The Portland School Board completed negotiations last week for a new school site in Laurelhurst consisting of a block bounded by Royal Court, Laurelhurst Ave, East 41st and East 52nd Streets. The property was purchased from Mead & Murphy for $33,500. Several suggestions have been made regarding the type of school to be erected. Although the School Board declined to give definite information on the subject, it is probable that the new school will consist of a number of cottages built around the exterior of the block, with a court in the center, in what is known as the cottage school system. This, say the supporters of the plan, would insure safety in case of fire, besides preventing the disturbance of students in one room by confusion in another. The people of Laurelhurst are enthusiastic over the new school, for it is in the center of an area of 677 blocks between East 28th, East 10th, East 57th, North and East Hancock Streets, which has formerly been without a school. It is asserted that some of the children have been walking a distance of 23 blocks to school. 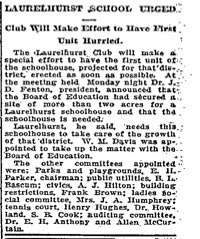 The Laurelhurst Club will make a special effort to have the first unit of the schoolhouse, projected for that district, erected as soon as possible. At the meeting held Monday night Dr. J.D. Fenton, president, announced that the Board of Eduction has secured a site of more than two acres for a Laurelhurst schoolhouse and that the schoolhouse is needed. Laurelhurst, he said, needs this schoolhouse to take care of the growth of that district. W.M. Davis was appointed to take up the matter with the Board of Education. It would be nice to find some more articles. I still need to do more searching. They obviously built the school as I found this snippet from 30 Apr 1920 where they changed the name of it, "The Board Authorized changing the names of the Eastmoreland and Laurelhurst schools to The Abigail Scott Duniway and Harvey W. School schools, respectively."